The international campaign to get the UN Security Council to introduce human rights monitoring into the MINURSO mandate and take action to prevent the exploitation of Western Sahara's natural resources is growing. 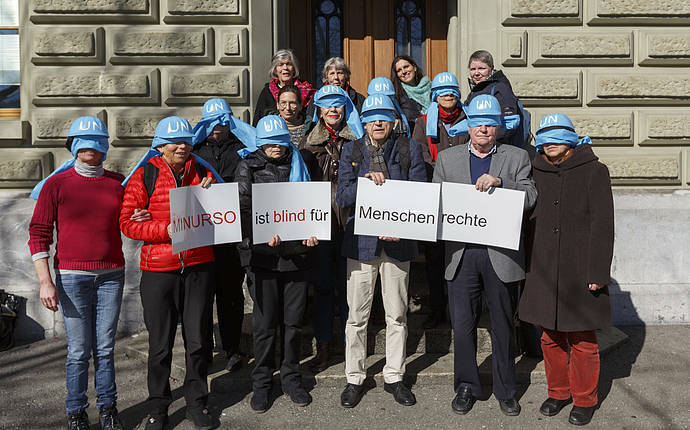 In Switzerland, Terre des Hommes delivered a petition to the Swiss Parliament and Federal Council supporting the call to extend MINURSO's mandate. The petition included the signatures of 45 organisations and individuals. Read more here. In New Zealand, which currently has a seat on the Security Council, a campaign has been launched to persuade the government to act in seeking human rights monitoring in MINURSO as well as questioning New Zealand's use of Western Sahara's natural resources. In Spain, CEAS and Um Draiga are working together on a campaign to write to UN Security Council members to get human rights monitoring on the MINURSO agenda. Find out more. The campaign is further spanning the globe. Join us! With more supporters, we get closer to urging the international community to fulfil its responsibility to ensure that the Saharawi can express their right to self-determination. Write to the UN Security Council to protect rights and resources in Western Sahara.